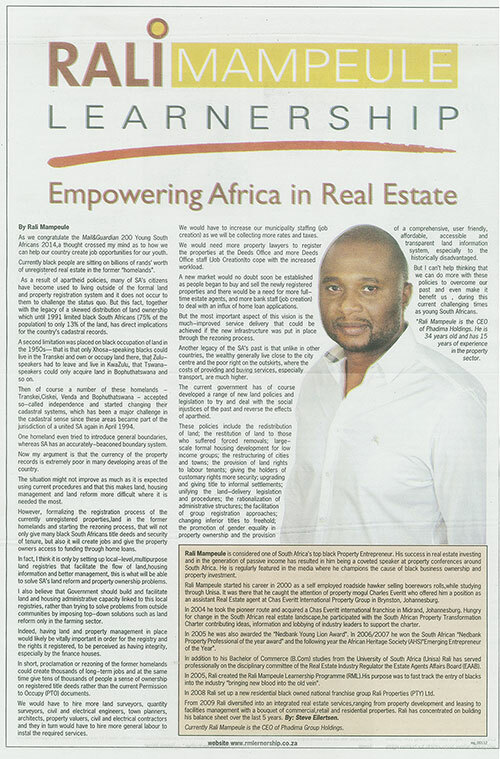 Rali Mampeule is considered one of SA’s top black property entrepreneurs. In 2004, Limpopo-born Mampeule (34) acquired his own Chas Everitt International franchise based in Midrand. For his ground breaking acquisition, he was awarded the Nedbank Property Association Young Lion Award in 2005. More than 19 million black South Africans own a home but do not have a legal title deed – this prevents them from getting further funding and tapping into their own wealth in order to create further development. This skewed distribution of legally owned real estate installed under Apartheid government can now be challenged and dismantled. Rali talks about the win-win for all concerned as this property wealth is used to fuel development. As we congratulate the Mail&Guardian 200 Young South Africans 2014,a thought crossed my mind as to how we can help our country create job opportunities for our youth. for the country’s cadastral records. Summons against the Greater Tzaneen Municipality for an amount of R36 746 937,04 has been issued and the case will be heard in the South Gauteng High Court (Johannesburg) on a date to be confirmed. The plaintiff is Phadima Group Holdings (Pty) Ltd of Mr Rale (Ralebala Matome) Mampuele who would have developed the Aqua Park Security Estate (Avis Park Ext 53) next to Voortrekker Road on the way to the Tzaneen Dam.